Due to a generous grant received by the McLeod Foundation from The Duke Endowment, Marlboro County has been able to establish a community paramedicine program. These grants support the mission of McLeod Health, which is to improve the overall health and well-being of people living within South Carolina and eastern North Carolina by providing excellence in health care. Marlboro County suffers from exceptionally high rates of chronic illness and poor access to care which leads to these conditions often being poorly managed. Marlboro County sits last among all South Carolina counties in diabetes monitoring, with only 62 percent of Medicare enrollees receiving HbA1c monitoring (South Carolina’s second-worst county is at 73 percent). Consequently, hospitalization rates for diabetes are 89 percent higher in Marlboro County than in the state as a whole. Rates of hospitalization for heart disease, hypertension and chronic lower respiratory conditions are 86 percent, 63 percent, and 57 percent higher in Marlboro County than the entire state, respectively. Marlboro County also ranks 44th of the 46 counties in health outcomes, according to County Health Rankings. 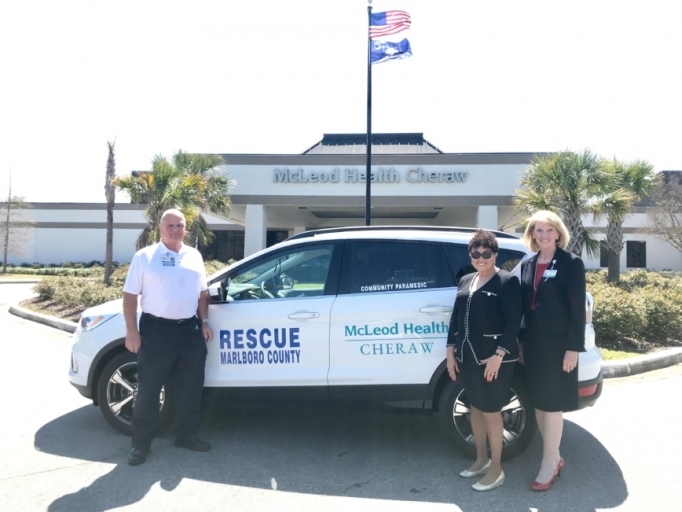 Chronic disease mismanagement is a challenge to the day-to-day operations of Marlboro County Rescue and McLeod Health Cheraw, with residents using these facilities for primary care. Marlboro County sits in the 99th percentile in the United States in EMS utilization. Sixty percent of McLeod Health Cheraw Emergency Department patients come from Marlboro County, of which two-thirds are uninsured. The goal of the Community Paramedicine Program is to help these heavy-utilizers better manage their illnesses. Patients who have been to the Emergency Department four times in a single year for conditions related to a chronic illness – such as Chronic Obstructive Pulmonary Disease (COPD), congestive heart failure, diabetes, and hypertension – will be visited at home by a paramedic. The first visit will occur within 72 hours of discharge, and regular home visits will continue for up to one year to ensure that the patient is following their discharge plan and properly managing his/her chronic condition. If the patient is compliant for approximately two months, the patient will be discharged from the program. In addition, patients will be connected with a primary care physician if they do not have one. The Community Paramedic will monitor patients’ vitals, and will ensure that they are taking medicine properly, visiting a primary care physician, eating and exercising properly, and otherwise effectively managing their illnesses. The Community Paramedic will also serve as a contact for program participants by facilitating a telemedicine virtual visit, from the patient’s home, connecting them to a McLeod Primary Care Provider. Having the ability to first contact the community paramedic will significantly reduce non-emergent 911 calls and visits to the Emergency Department. With a physician’s order and a patient’s consent, the Community Paramedic follows up with patients outside of the traditional healthcare setting, usually in the patient’s home. The services they provide include: primary and discharge care, chronic disease monitoring, medication reconciliation, healthy lifestyle education, patient education, home safety assessments, cardiovascular monitoring and education, respiratory management and follow up after discharge. “We have already received so much positive feedback on the benefits of providing something like this in our underserved rural communities,” said Lawson. The Honorable Patricia Henegan, State Representative for Marlboro County, fully supports the initiative which will provide better health outcomes for those living in her district. “A common barrier in this county is the lack of transportation which makes it extremely difficult for patients to get to their follow-up appointments after their visit to the Emergency Department or after being discharged from their hospital stay,” said Representative Henegan. “Unfortunately, many residents do not have a method of getting to the doctor on a regular basis, which causes their conditions to worsen. This program should help eliminate some of these barriers by connecting them to crucial preventative services. Photo Caption: Community Paramedic, Jay Lawson, The Honorable Patricia Henegan, State Representative for Marlboro County, and Mib Scoggins, Administrator for McLeod Health Cheraw, stand in front of the Community Paramedic program vehicle that will bring healthcare directly to the homes of patients referred into the program.